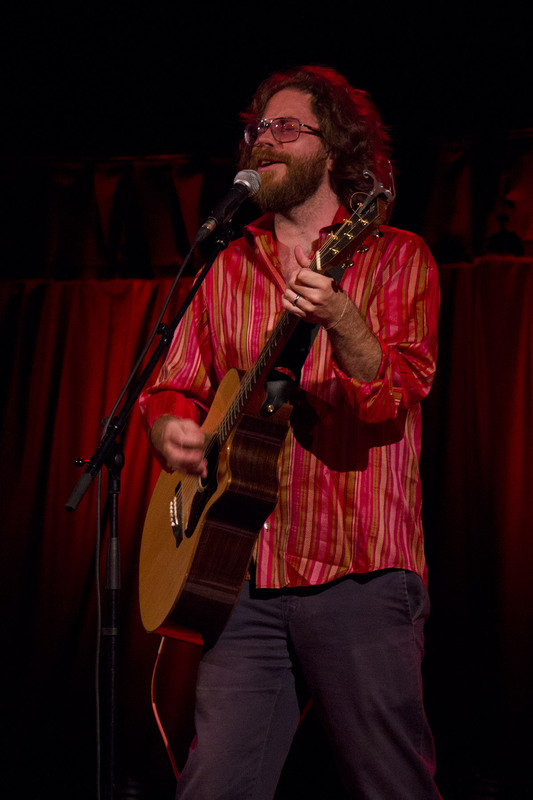 Musician, singer-songwriter and all-round internet superstar Jonathan Coulton, famous for such songs as ‘Code Monkey‘, ‘Re: Your Brains‘ and ‘Still Alive‘ from the ‘Portal’ video game, swung by our neck of the woods last weekend as part of his third UK tour (+Stockholm, Sweden). His laments about mad scientists who just want to be loved, a giant squid that crushes everything, and moons comforting their recently demoted planetary partners, speak to legions of geeks and nerds out there. Escapees Rich and Chrissey went along to the show at Bristol’s Colston Hall. Since he last toured the UK over a year-and-a-half ago, he has released his latest album ‘Artificial Heart‘. Produced by They Might Be Giants‘ frontman John Flansburgh and featuring guest vocalists Suzanne Vega, John Rodderick and Sara Quin (of Tegan & Sara), this is his first proper studio album since he released ‘Smoking Monkey’ over 7 years ago. (It’s really good, you should go buy it). 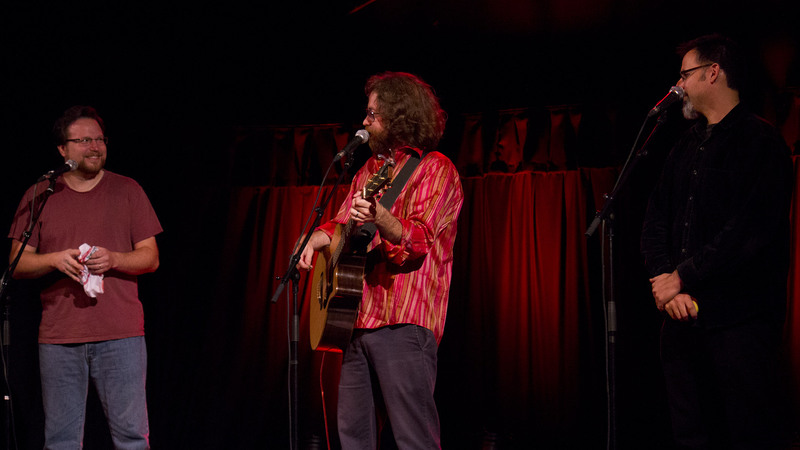 As ‘JoCo’ explained at the start of his gig, this is technically his ‘new album tour’, even though the CD came out a year ago. With musical comedy duo Paul and Storm in tow, the concert was one for fans, with all his well-loved classics and popular tracks from the new album but no sneak peeks at upcoming releases this time. Having seen him perform on the Bristol leg of both his previous UK tours, there was a lot in this gig that we’d seen before, but in our opinion, very few of his songs get old; kind of like meeting up with an old friend to reminisce about the good old days. There were a few interesting change-ups over previous years: no Skullcrusher Mountain this time but new songs ‘Sticking It To Myself‘ and ‘Good Morning Tucson‘ surely made up for it, and crowd pleasers ‘Re: Your Brains’ and ‘Shop Vac‘ went down well, as always. The show wasn’t without its hiccups. A pause to fix a broken guitar string, ironically sustained during slower tempo number ‘Soft Rocked By Me‘, prompted an impromptu a-cappella rendition of Madness’ Baggy Trousers from Storm and an audience sing-a-long to Dexy’s Midnight Runners’ classic ‘Come On Eileen’ (Dexy’s were playing in the main Colston Hall venue that night). Novelty underwear was pressed into service as a bandage and there was the usual number of false starts, but the hiccups are all part of what makes the show so entertaining. Coupled with plenty of audience participation and interaction, the audience feel involved and leave feeling they’ve been part of something personal. Whilst we were there, we got Jonathan Coulton to sign a copy of his Greatest Hits album ‘JoCo Looks Back‘ for you guys, and he gave us permission to give it away here! With 20 tracks in total, including Code Monkey, I Feel Fantastic, Ikea, Skullcrusher Mountain, Chiron Beta Prime and First Of May, this is a great starter into the world of Jonathan Coulton. And remember, you can like us on Facebook or follow us on Twitter to keep up to date with new content and events.